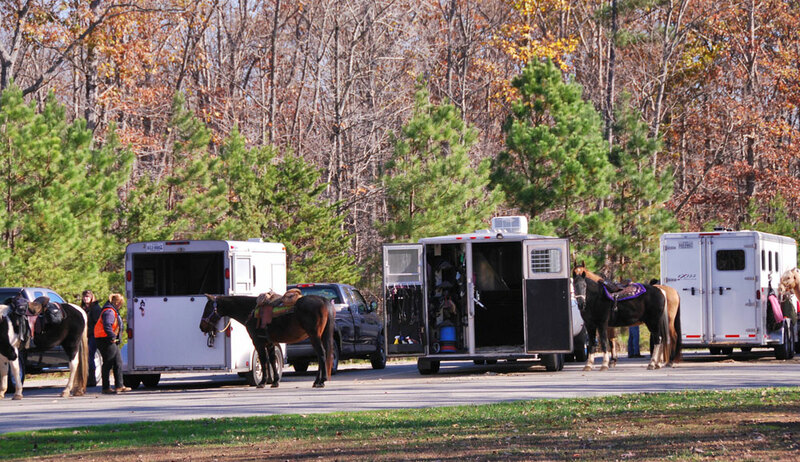 Here's how to find a safe rest stop for your horses during a multi-day trailer trip. If you travel with horses at all, it’s likely there will be a time when you’re hauling just far enough to make an overnight stop a wise decision for your horse’s health. Whether you’re heading to a far-away horse show or clinic, or you’re picking up or selling a steed, it can be helpful to know just how far you should go before you need to let your horse rest—and if that rest needs to be simply an hour or two or if it needs to be a chance for him to catch some sleep. Before you begin, you’ll need to decide on how far you’ll haul your horse per day. Keep in mind the road and weather conditions on your route. In good conditions, you can generally expect to haul between 400 and 500 miles per day. Common guidelines suggest that a horse not be shipped more than 12 hours without a chance to get off the trailer and rest. Though you may be game to drive much farther before you need to rest, it’s important to remember that traveling is very tiring for your horse. It takes a lot of effort for him to keep his balance as you accelerate, decelerate, turn and stop. For this reason, it’s important to give your horse time to stand and rest when the trailer is not moving. Take a 30-minute to one-hour break about every 4 hours or so. You don’t need to unload your horse for him to relax. In fact, it’s better not to unload your horse at any rest stop until you have safely reached your layover destination. For these mini-breaks, park in a shady area and open drop-down windows and doors to increase airflow in the trailer. Use this time to look at your horse closely for the following things to make sure that hauling is not causing him undue stress. Check to be sure that he is breathing easily and that he looks bright and alert. Offer him water every time you stop, though he may not drink. Finding a reputable facility in which to put your horse for the night is nowhere near as difficult as it was pre-internet. Additionally, some forward-thinking equine enthusiasts have created a niche in caring for horses traveling long distances. 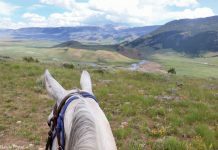 Though there are now a plethora of options to overnight your horse, begin looking early if you know you will need a place to stay for a night or two. Some popular equine rest areas may book up months in advance (especially if they are near state parks of other popular riding areas), so don’t be discouraged if your first choice is full. Once you have found a few places online you think might be appropriate for your needs, be sure to read reviews of the location. Consider asking about the location on your social media feeds—you may be surprised at how many of your friends have made the same trek you are embarking on. Also keep in mind that some state and county fairgrounds allow horses to overnight at their facilities. How far is the facility from the interstate? What does the facility provide (hay, bedding, buckets, turnout)? Are there specific haul in and haul out times? Will someone be there to meet you? Can you turn around easily? With helpful tabs on state-by-state requirements for vaccinations and paperwork, as well as an “outbreak alert” tab that keeps you up-to-date on potential equine illnesses that may be in your travel destination, this website can be a helpful resource as you plan a multi-state journey. Created from experience, HorseMotel.net allows visitors to search for equine layovers based on the United States Interstate system. Facilities listed on this website must be close to a major interstate to be included, so travelers will not be far from the exit. Traveling Horse Transport and Stables Directory offers a plethora of tips on shipping your horse, and a state-by-state listing of motels, B&Bs, locations with RV hookups and more. I will have to check out the links. Lots of good advise and ideas in this article. I agree, lot of important information for those who travel with their horses. For someone who travels with their horses, these were good links to follow. with the heat we are having now, so many riders are cancelling their trips, but this aarticle as a lot of good advise and thoughts. We are just going to purchase a large lot and want to put up an indoor riding/ horse stop facility with ability to stay overnight in your trailer and let your horse out to rest and exercise. Location just 1/4 mile off I90 in south central Mn. What would suggestions be in our planning and would there be a great need in this area? Opinions and suggestions welcomed.